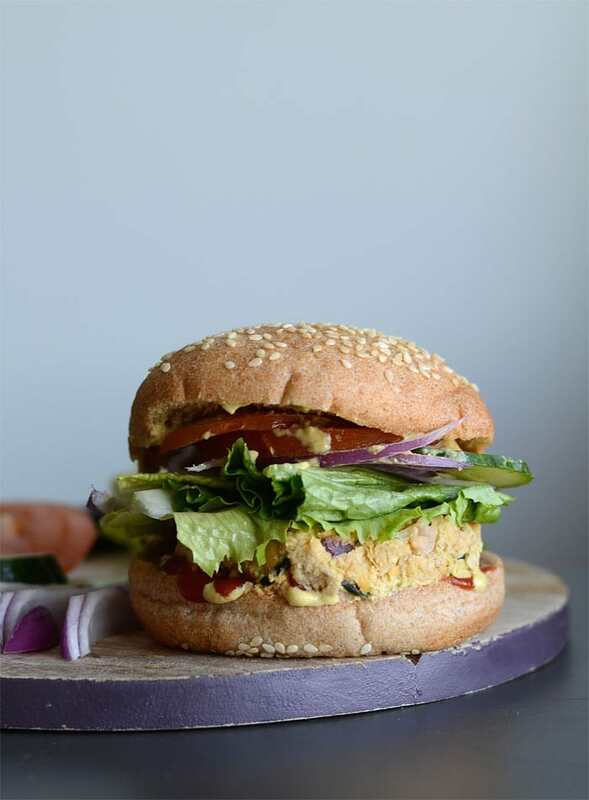 So, I’m kinda excited about these veggie burgers…almost excited as I am about these veggie burgers but that’s another story (one you should check out because they’re awesome). Lemon and tahini are two of my favourite ingredients, partly because they’re the key to amazing hummus, but also because they’re both healthy, flavourful and versatile foods that I use in a ton of recipes. 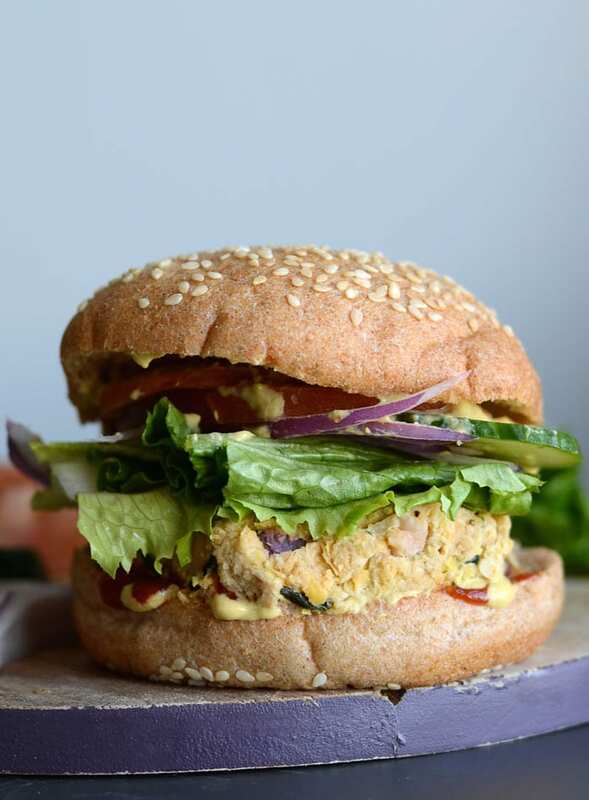 These veggie burgers are made with chickpeas, zucchini, tahini, lemon, oats and a handful of yummy flavour boosters such as garlic. Best thing about these beauties, if you cook them over medium heat in a good non-stick skillet, they come out crispy and perfect on the outside, soft on the inside and THEY WILL HOLD TOGETHER! The fact that they hold together actually makes them perfect for grab-n-go snacking next day too! I typically eat these with a big salad on the side but they’re also amazing on a delicious bun topped with all your favourite veggie burger toppings. Avocado, lettuce and tomato makes a great combo! 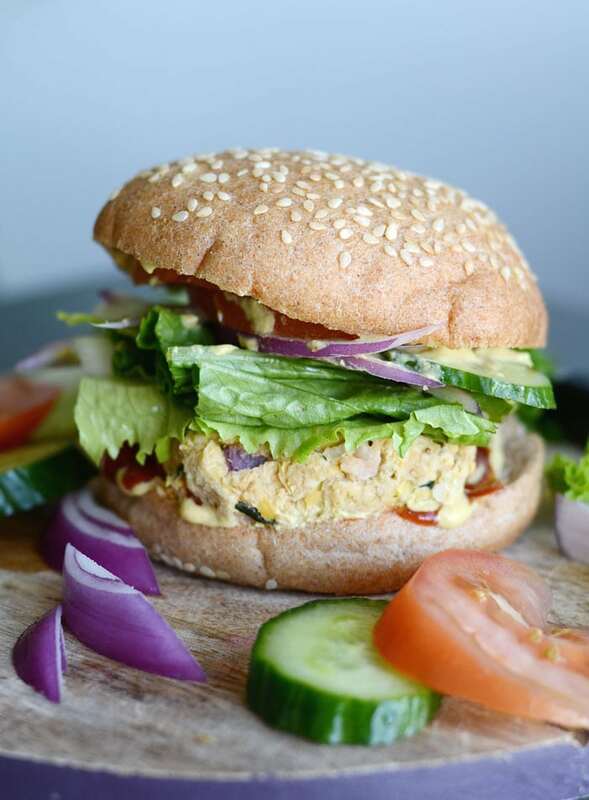 Try adding an extra drizzle of tahini on top too…amazing. Place the chickpeas in a bowl and mash with a fork. It’s okay if some whole chickpeas are left but it should be mostly mashed up. It can be chunky though. Use your hands to form the mixture into 9 patties. Lightly spray a good non-stick skillet with cooking oil and heat pan over medium heat. 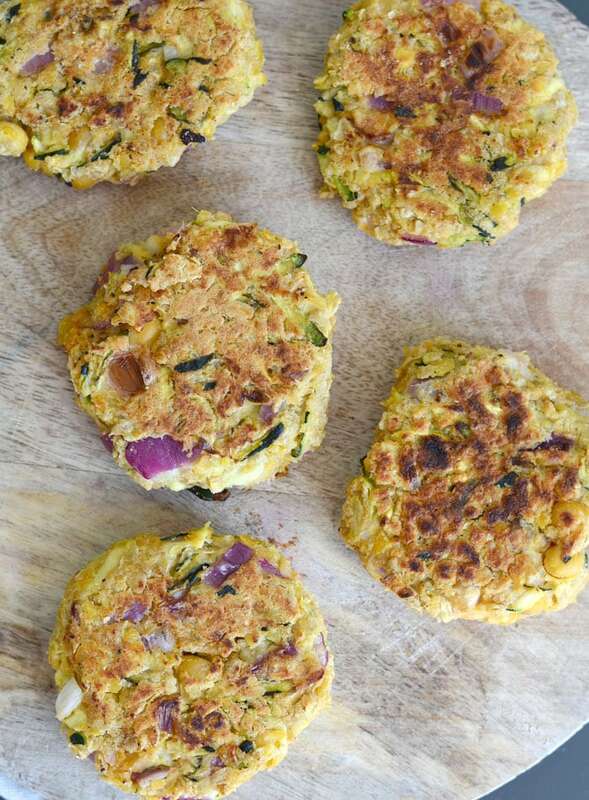 Cook the burgers for approximately 10 minutes per side until crisped and firm. If you stick to the weighed measurements as above, the mixture should be perfect for forming patties. 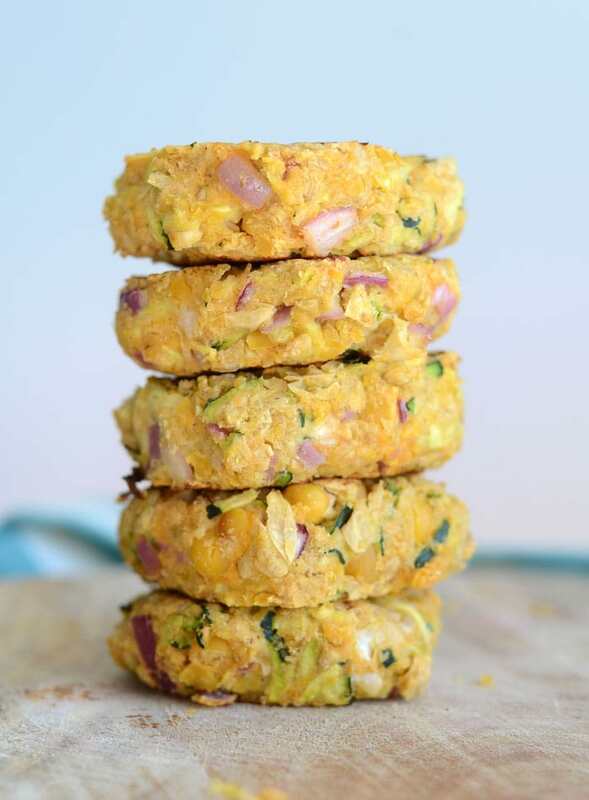 If you find it’s a bit too wet though, simply add more quick oats, 1 tbsp at at time until you can form patties. You can also make them bigger if you want! If you guys enjoy this recipe, please take a moment to let me know in the comment section below and share via your favourite social network below! I really appreciate any support you can show Running on Real Food and I also just love to hear from you! You can also tag me on Instagram @runningonrealfood if your version of my recipes, so I can have a look! You guys are DA BEST!! Seriously, love you. -D.
These sound delicious! Btw, love your blog. I just discovered it last week because I’ve just started macro-tracking, and I’m vegan. So I was looking around for info on vegan macros and came across your blog! 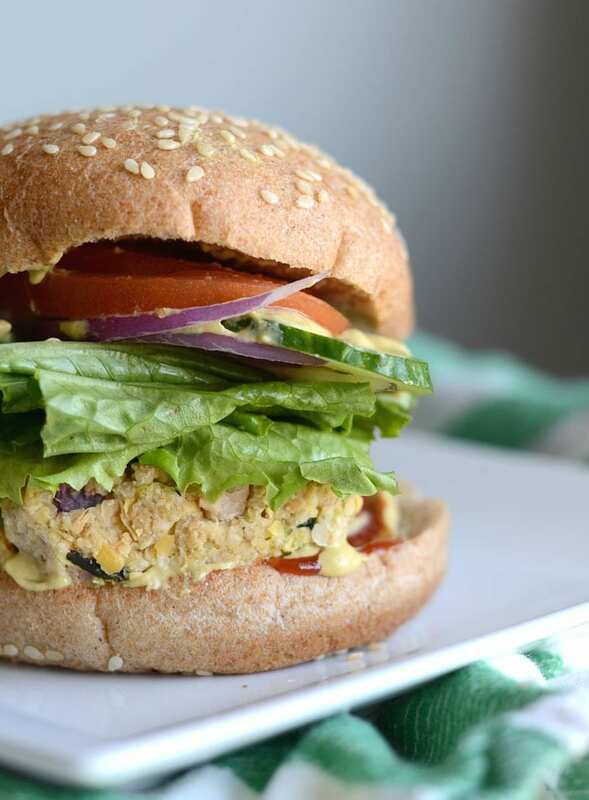 Mmmmm… Veggie burgers are the best.. These burgers are a must! I baked them, 13 minutes per side. Turned out great! True taste of spring with the zucchini and lemon. I added zest of whole lemon & this amount is perfect. Looking forward to trying many more of Deryn’s recipes! Thank you so much for your comment and feedback, Tina! I really appreciate it! So happy you enjoyed the recipe. I made a large batch of these and fried them up twice this week! I’m by no means vegan [SORRY!] but love so many vegan/vegetarian foods. I could certainly eat a lot less meat but my husband, not so much! I did however, add an egg to the recipe because my first couple burgers were falling apart. The egg really helped bind them. Also made a lemon/tahini/garlic and vegan mayo aoli to go with this and it was awesome! Sorry they were falling apart for you! That mayo aoli sounds amazing, I was thinking of doing the same…will have to try it next time I make these! Thanks so much the comment, I really appreciate hearing from you! Looks so good! Very nice post! Thank you so much! I believe readers have had success with freezing them in patties. I haven’t tried it myself but it should work fine! Anything with tahini is guaranteed to get my mouth watering, but i always struggle what to put it with and I’m getting a little bored of always pairing it with falafel, can’t wait to try this! I have recently discovered a new eating lifestyle prompted by a book that I have purchased. 7 Steps to Health. I’m a diabetic and since slowly changing my eating habits to a plant-based, raw diet I have lost 15 pounds in 6 weeks and have lowered my insulin units by 10 already. I’m trying to find some healthy alternative recipes that I can add the my meal plan and some of your recipes look wonderful. Thanks for the ideas and inspiration. Any advice you could offer on my new way of eating would be very much appreciated. Can you bake the burgers s well? Wow, I just love this super unique dish!!! So healthy and beautiful at the same time. My kid really loves this. Thanks for surprising me over and over again with great ideas! I have recently become a vegan and have been trying a bunch of new recipes. I came across this gem and I’m so glad I did! Not only did I love them, but my hubby (non-vegan) did as well! Will definitely be making these again! Thank you! Woohoooo! That makes me sooo happy. Thanks so much for letting me know! These have become a staple of mine. Thanks for the recipe! You’re welcome! So happy you like them! 🙂 Thanks for letting me know.